It’s all about seeing, isn’t it? This article introduces you to my Rouen Cathedral Suite #1-10 from 2015. Having lived with art since I was born, I’ve always played with the idea of doing photography with reference to the art I cherish. Since 1969, I have looked at Roy Lichtenstein’s 6-piece Cathedral Series from that year which was based on Claude Monet’s Rouen Cathedral paintings that Monet did in the 1890s. My father bought the Lichtenstein series when it was published. Gemini G.E.L., one of the finest graphic art printing houses in the world, printed them. They look like screens, newspaper-like and “pop” where the Cathedral image – with the colours expressing the light as it changes over a day – was hidden under (or in) tons of small round holes. One has to see them at a 3-4 meters distance to at all see anything but dots. And they were fairly big, 122 cm high. And who would not love to have owned one of Claude Monet’s originals? Like this one? So why do I find this fun, interesting and challenging? I believe that art is as much about seeing as about what you see. Here is an entrance to a cathedral which, thanks to one of art history’s greatest, has become immortalized. I have always loved Roy Lichtenstein’s series, his truly innovative idea, his re-working of classical art and his ways of making us see – as he also does in, say, the Bull Series and Monet’s Haystack Series. In a way, he applied filters and reproduced/re-created great pieces adapted to contemporary printing techniques. I stole the basic idea and asked myself: What if I do the same using Photoshop? In the 1960s, no one had access to PhotoShop which was created about twenty years later, in 1988. So I downloaded a photo of one of Monet’s original paintings from the Internet and began to play with it. I played with shapes, filters, light, contrast, saturation, colouration/tones, contrasts, sharpening/blurring and I changed things here and there, pixel by pixel so to say. I did many many more than the 10 I finally selected to be included in my series. You may think it looks like just some haphazard re-production. It isn’t. It’s a carefully processed experimenting with literally hundreds of variables in each of the suite’s ten pieces. To the left in this photo, you see one of the original Lichtenstein and then my A2 format prints on fine art Canson Edition Etching Rag papers. Lichtenstein cropped the original portal, my picture is a based on the full image of the cathedral portal that Monet painted. I guess that Photoshop – or Photoshop-like – techniques is what Roy Lichtenstein would have experimented with had he created his series in 2015 and not in 1969. I am immensely attracted to the possibilities of the digital technology, advanced printing techniques and whatever else that permits me to play with image-making. I can’t imagine that he would not also have been fascinated with all those possibilities – as is, in a totally different way, David Hockney. And I don’t mind that painting and photography mix and stimulate each other. My concept is anyhow photographics, not only photography. I like my works to appear like pieces of graphic art, always printed on matte papers. So, we can take an existing image, we can re-paint it, we can re-create it as photography, we can see it in new ways, apply filters, patterns and colours and create all possible variations on a theme – in this case Monet’s and Lichtenstein’s fascinating, classical works. A picture that is not immediately seen in all its characteristics invites – or challenges – us to see more deeply. Like a blurred image where you have to perceive and interpret what you (think you) see – say a mountain painting of Gerhard Richter that looks rather much like a foggy-blurred photographic image. The less you see immediately, the more you have to look deeply and clarify. I like images where everything is not seen immediately. I like the diversity of variations of a theme. And I’ve tried to put the Suite’s ten images up in a sequence that can be seen as following the day, from morning to evening with # 10 bathed in moonshine. But that is only a way to hang them and number them. I didn’t plan to do them like that, I did not plan to make them show the daylight over some 24 hours. 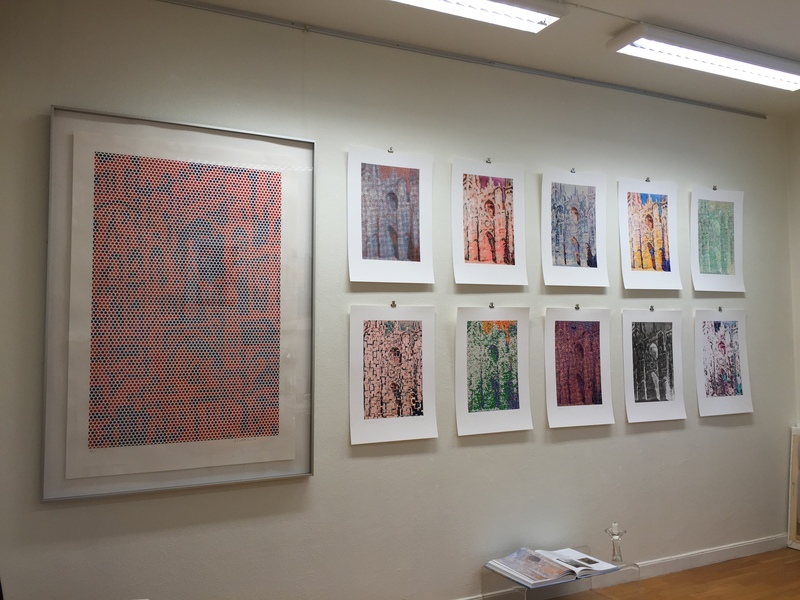 I only found that when hanging them for the Cultural Evening in Lund in September 2015 – i.e. in presenting them to my visitors, it was fun if I could hang them in a sequence that might (or might not) be compatible with the light changes over 24 hours. I can look at these ten pieces for hours. I have enjoyed tremendously every minute it’s taken me to create each one of them. It was much-needed meditation, intuitive changes and re-evaluation over time. I dropped quite a few on the way, images I thought were rather exciting when I made them but later lost interest in. Deleted, erased! So, to put it crudely – it is all a matter of re-searching, re-creating and re-viewing – dialoguing with towering figures of art history and create an explorative dialogue between the spectator and my work.